Summary: We will develop a 5th grade curriculum about sea turtles. By learning about endangered species and by investigating the potential impacts of human activity and climate change on sea turtle survival, youth are more likely to become adults who care about and take action to protect sea turtles and other wildlife. The curriculum will teach several actions that people can take to help protect sea turtles. These include using turtle-friendly lighting; reducing marine pollution by decreasing use of plastic bags, not releasing balloons, recycling fishing line, and picking up trash at the coast; filling in sandcastle holes at the beach; removing recreational equipment (e.g. umbrellas) from beaches; as well as teaching others. As part of this curriculum, students will learn about sea turtle research and will analyze data: they will track; they will learn about sea turtle rehabilitation and will have an opportunity to talk to staff at the Georgia Sea Turtle Center (through Skype); they will learn how TEDs work to reduce sea turtle deaths in shrimp nets; they will learn how climate change might impact sea turtles and will design and test methods to help protect sea turtle nests from increasing temperatures. As part of the sea turtle curriculum, we will write a quality, professional illustrated, chapter book that will be freely available for download or to read online. Although there are numerous books available for younger children or adults, there are no currently-available sea turtle books for this age group (upper elementary to middle school) containing information about sea turtle biology/ecology. Results: The text of the 85-page book was modified based on feedback from STC on the draft (submitted with the 6-month report). Illustrations were purchased from Dawn Witherington and incorporated into the book, along with Creative Commons-licensed, or other images used with permission. Many (19) of the 40 images provided by Dawn are complex illustrations. Our initial plan was to purchase 60 simple images to include in the book, with existing images quoted at $40 each and new illustrations at $200 each. Between the time of the proposal and the time of the book creation, Dawn had already created a number of images that we had planned to commission for other projects. She agreed to provide the 21 simple images and 19 complex images for the $4,000 that was budgeted. The book is now considered completed (pending approval by STC). The book will not be being printed, but will be made available as a pdf document online (for free download). Ten lesson plans, one for each chapter of the book, have been written and correlated to 5th grade national and Florida education standards (language arts, mathematics and/or science, as appropriate). 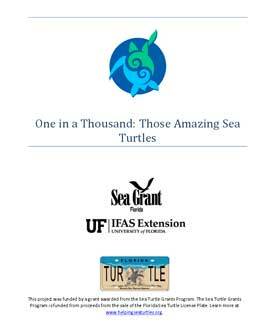 These lesson plans will be made available as free downloads from the sea turtle curriculum website (http://stjohns.ifas.ufl.edu/sea/seaturtlecurriculum.html), along with the book.